Gorn are tall. grey-green. bipedal reptilians. They have large hard multifaceted eyes. and a wide. sharply toothed mouth. Their large brains are devoted almost entirely to thought and speech. leaving little for muscular operation. This makes them slow-moving. and deliberate with their actions. Though no Federation representatives have visited Gornar. the Gorn homeworld. it is known to be covered with warm. tropical jungles. They Gorn have developed a highly advanced technological society. and appear to be skilled engineers. They have ships with warp propulsion and weaponry equivalent to those used by Starfleet. First contact with the Gorn was established on Cestus III. A Federation colony was destroyed by a Gorn vessel claiming the system was within Gorn territory and the colony had illegally invaded Gorn space. Since that time the Federation has maintained close contact with the Gorn over deployment along the border to avoid future incidents. A Gorn's tough reptilian skin gives it a + 1D bonus to resist physical attacks. Gorn can perceive a wider range of audible frequencies than most races, giving them a +2 to hearing based PER rolls where applicable. 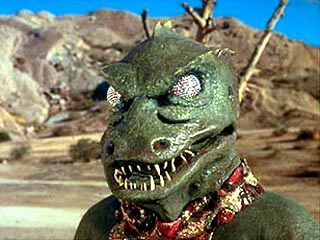 Gorn can see a wider area around them due to their large multifaceted eyes. The eyes are coated like an insects. so they are not lidded. Gorn are naturally very slow-moving, giving them a -1D to their PER only when rolling for initiative. Gorn are deliberate and merciless in their actions even by human standards. The Gorans (as they are known in the Kilb-iverse) are an offshoot of the Trandoshans and actually are from the same evolutionary genetic stock as the Trandoshans and the Triogs (Lizard men) near Gonmo. The Goran homeworld was colonized by Trandoshans seeking to build a galactic empire, this idea fell through when they realized that the money wasn't there. Instead they decided that three galactic senators in the Galactic Senate was much better than just one, the three senators often vote for anything that is favorably to them and anything that will further oppress the Wookies. The Gorans are not well liked by the Bajorns and despite this fact the Gorans don't seem to lose any sleep during their sleep cycles.